I am really excited about the upcoming advent season and hope to share more about that with you in the coming weeks. I ordered the Naptime Diaries advent calendar and plan to join in with Samantha's advent photography. Jordan and I are really wanting to be more intentional about the advent season in a way we haven't been in the past! p.s. Laura is hosting a giveaway of an Advent devotional from She Reads Truth! It closes tonight! It has been an absolute joy to spend my days working at home with R. I do not take it for granted, and even though it has been very hard and tiring, it has also been very wonderful. She makes me so happy every day! Plus, bonus! My arms are getting toned. Seriously. We weighed her when we were at my parents' last weekend, and we're pretty sure she's up to 13 pounds! Jordan and I have been in our house for almost five full months and we LOVE it. Are there a lot of projects we still need to do? Of course. Is there furniture we still need to buy? Definitely. But it has been a huge blessing to have a house to bring R home to, and we are so thankful. FYI: I blogged our house tour here. I am extremely thankful for my job! I've been there 2 years now, and I am really enjoying it. I love what I do and I enjoy my coworkers. Not everyone can say that, and even though I wish I could stay home with R, I am thankful I am not going back to a job I hate, because that would really be terrible. Plus, it's become clear that I need a job to support my online shopping habits. TOO MANY CUTE BABY GIRL CLOTHES. TOO MANY HAIR BOWS. Someone stop me. I am so thankful to have been able to exclusively nurse R for over three months! I know many people would love to nurse and aren't or weren't able to, and I am thankful that I have had a large supply that seems to keep her fed. I find myself only needing to pump out of necessity (if you know what I mean) than because I feel like I need to build up a stash. I plan on exclusively nursing at least until I go back to work in January, and ideally we would like for me to mix in solids with nursing until she is one year old. On that note, this is not in any way a complaint, but nursing is hard work! I don't think I truly appreciated all the nursing mothers out there, but seriously. It's tough! I'm hungry and thirsty around the clock, I've had to deal with a few blocked milk ducts (super painful), and it can be hard to schedule sometimes, especially when you're on the go. Still, I am very thankful to be able to nurse. Cuddles with R and hey, it's free! The news is terrible, and every day it seems like there are more horrible stories of hatred, not forgetting of course the recent Paris attacks, which were truly awful and heartbreaking. I love seeing people come together and be kind to one another. My blog post about how to be a good friend shares a good reminder of a great way we can be kind to others and show we care about them. With the upcoming holiday season, it's easy to get caught up in a busy schedule and focus on all the things we have to do, but we should also not forget to take time to show kindness to others around us, especially those who may feel sad for one reason or another this time of year. 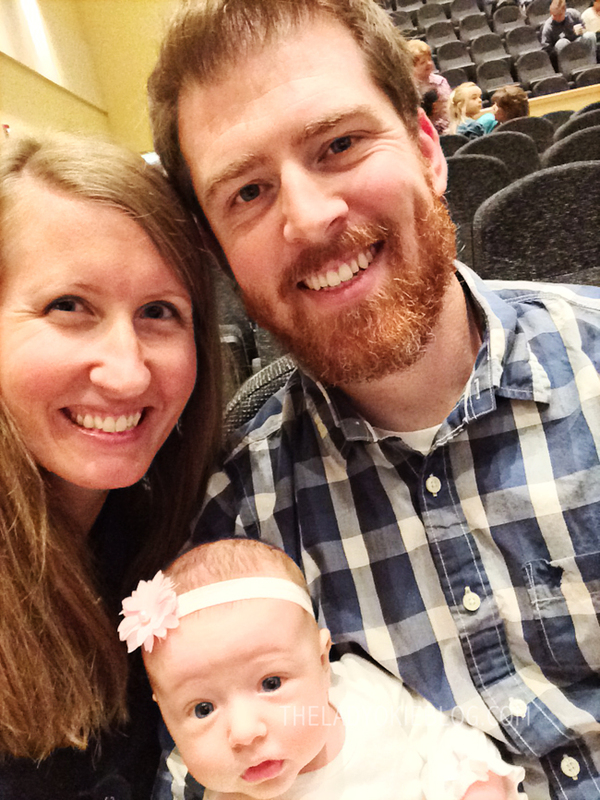 R's baby dedication last weekend was a lot of fun! My parents drove up from Texas, and Jordan's parents were there too (they live in the same town as us), and after the service on Sunday, we all went out to eat! I am thankful our parents get along and that we have such great examples of godly marriages and parenting to model ourselves after. Since R has decided that milk hurts her stomach, I have been cut off from 1 of the 2 beverages I drink on the daily. I used to go through a gallon a week by myself. I heart milk. so much, but now that our love affair is over, I'm guzzling water all day long. I often think back to my time in Nicaragua last summer and how blessed we are to be able to turn on a faucet and have as much hot or cold water as we want! I take my health for granted way too much, but occasionally I am reminded just how thankful I am of healthy legs that take me wherever I want to go. They've run marathons, walked circles around my house with a crying baby, and basically been the best thing ever. Yay for legs! Plus, you might not know this about me, but calf muscles are my favorite ever. They are something I always notice about people. Is that weird? So those are just a few things I'm thankful for this year, but of course there are so many others. I'm also thankful for YOU who come and read my blog and comment and email me about my posts. Blogging is a really fun hobby for me, and I hope I've kept it interesting around here even after having a baby! Thanks for sticking around. Happy Thanksgiving! I hope you have a great week filled with family and friends and lots of laughter and thankfulness for all that God has given to us. Is anyone braving the Black Friday madness? I may brave the Black Friday stuff, but only in front of my computer screen. I scored some nice deals last year on winter coats and snowpants for Leah. Speaking of bows, I've been eying R's. 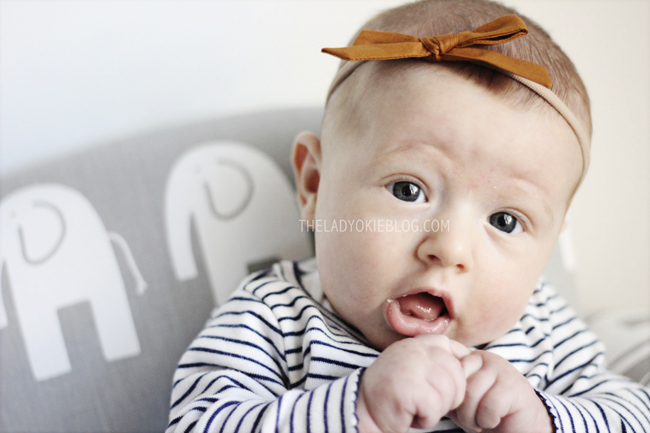 Where did you find the simple little ones with the beige headbands? Our bows are so big on our baby's head she feels lost in them. I'm so thankful for good health, for baby coos, and for my husband who's so involved in taking care of our little one. Happy Thanksgiving! Aren't they so cute? I'm not a huge fan of giant bows, so these are perfect! Happy early Thanksgiving! We all really do have so much to be thankful for, and sometimes it's easy to the small things like our health or having a job for granted. I hope you enjoy all of your family time next week! I really enjoyed reading this post - was so appropriate to come accross it today as we were discusing being thankful on Twitter! You have some awesome things to be thankful for! I'm thankful for my family even though I take them for granted. Hope you have a great thanksgiving! Happy First Thanksgiving as a family of three!! Get in all those R holiday cuddles next week. I am so excited for you and your first holiday season as a family of three! Legs! That's a great one! I'm also thankful for a clean, unlimited water source. Not so much that water in my basement that seeps through the walls every now and then, but...good with the bad, right? Happy early Thanksgiving! Hope you have a fantastic first Thanksgiving with R! Technology and a Teachers Even though I'm away from my sweet baby, I'm thankful I can keep an eye on him. I'm also grateful for the ones who care for and love him when I can't be there. Husband. In thankful for someone who works hard all day, helps with chores, and loves spending time with me and our baby boy. A home. A place where I feel safe and share with my favorite people. Nursing. Very hard, but I'm grateful my body functions the way it should and I can feed my sweet baby. Love those moments and cuddles. Knowledge and Education. I'm thankful for the opportunity and freedom to further my education to assist in my career. Finances. I'm thankful we have financial security and jobs we like. This might not always be the case, but right now we have truly been blessed. Unconditional Love from a God who's love knows no bounds. Little ones. My sweet pups who greet me every day with a wag in their tails. My sweet Nolan who greets me with his sweet smiles. And all the other little ones who brighten up the world with sounds of laughter. I love that you mention a handful of things that we often just take for granted - water, legs! I am keeping a things I'm thankful for journal and find I've been focusing on many of those same types of things recently. I hope you all have a wonderful 1st Thanksgiving with the little one! Soak up every moment!! I love this idea! My favorite picture is the LEGS! Too cute. And yes to nursing being hard work, but I love that it's free. I should calculate how much money I've saved. Ha. Loved this post! I'm a giant nursing lover too :) and I love all of your R pics as always!! Nursing, yes. Such a HUGE blessing. We fought so hard for it, and I'm glad we did. Sometimes I'm excited for it to be over, but I'm also going to be so sad. Oh, and those clogged milk ducts? The worst. I've had three. Ah! I've had three too! They are the worst. That guy next to you and Jordan at the baby dedication looks like her could be Jordan's brother. Ha ha! I think it's the beard. Your list was fun to read and I think it is interesting that the majority of people who did this acrostic put "time" for the letter t. R's a true gift. Baby girl clothes are the best. If I don't have a baby girl of my own soon, I'm going to have to start buying them for other people's baby girls. So glad you included all those photos of R because she's simply adorable. And growing so fast! It feels like I just read your announcement post and now here we are with her 3(?) months old. And I love that you included your job. I all too often forget just how important it is to be grateful for my job, especially since it's a job I, too, love. But I'm also super grateful for holidays, too, haha. Thanks for linking up! And Happy Thanksgiving! First off R is beautiful! Secondly, nursing IS such hard work! Good job momma. Love this list. And I'm feeling your pain on the dairy. E couldn't tolerate dairy either so I went a whole year not eating/drinking any of it. Now I'm completely hooked on almond milk! Lol. She is a lucky girl to have such a dedicated momma! I might need to try almond milk... I miss my morning cereal! Those are wonderful things to be thankful for and you have had a great year. Nursing is a very wonderful thing that if your body can handle it is really great. I love this blog idea and will definitely put one together for the link up - between nursings (seriously - hard work, you are so right). Really enjoyed your acrostic. So much to be thankful for. Happy Thanksgiving! So many wonderful things to be thankful for! I'm so glad nursing has gone so well for you even if you have had to cut out milk (which I'm sure has been a bummer! I remember when I stopped drinking milk and it was really difficult at first). Anyway, love all of these things to be thankful for. Family and work and R and water and legs... so many good things. :) Happy Thanksgiving, friend! Aw, I love this and all of the things you're thankful for. 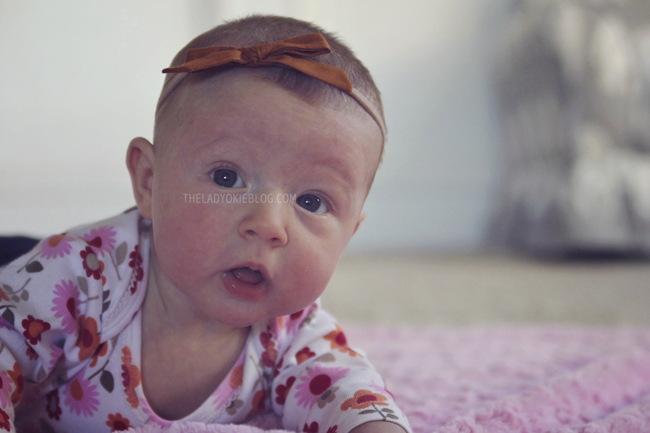 :) Baby R is soooo adorable, and I love her little flower outfit! 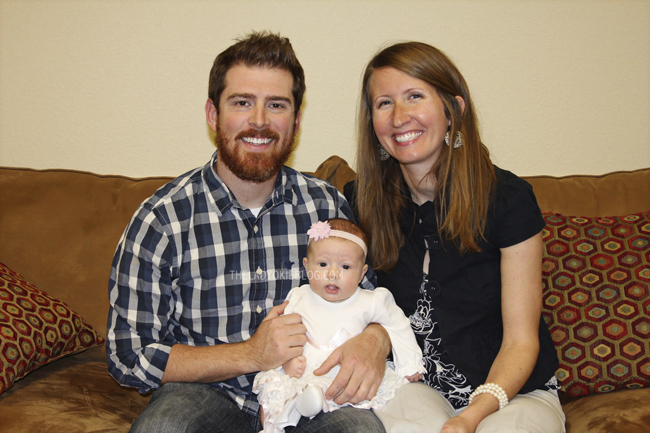 her little outfit is precious + how special to dedicate your little girl to the Lord! 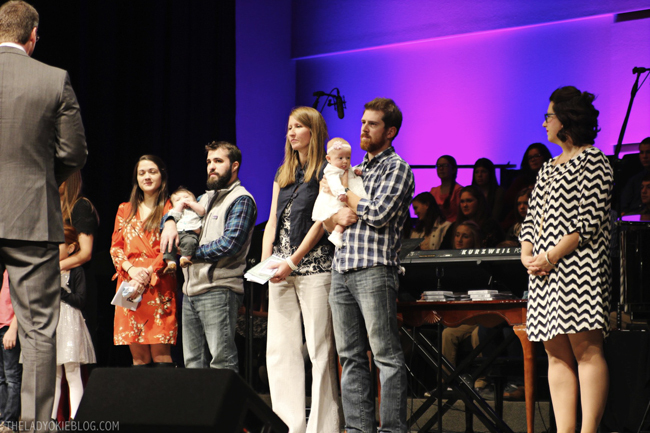 we had a few families this sunday dedicate and my to-be-mommy heart was so emotional! God is good!! Your daughter is adorable and as someone who was bald until 18mo I can't believe she already has eyebrows. Too cute! Tito Samuel has requested my presence at work on Friday so I'll hopefully not be tempted by the shopping nuttiness. I'm mostly just glad that 2015 is nearly over. It has been a wild ride. aww i love this post. so much to be thankful for! 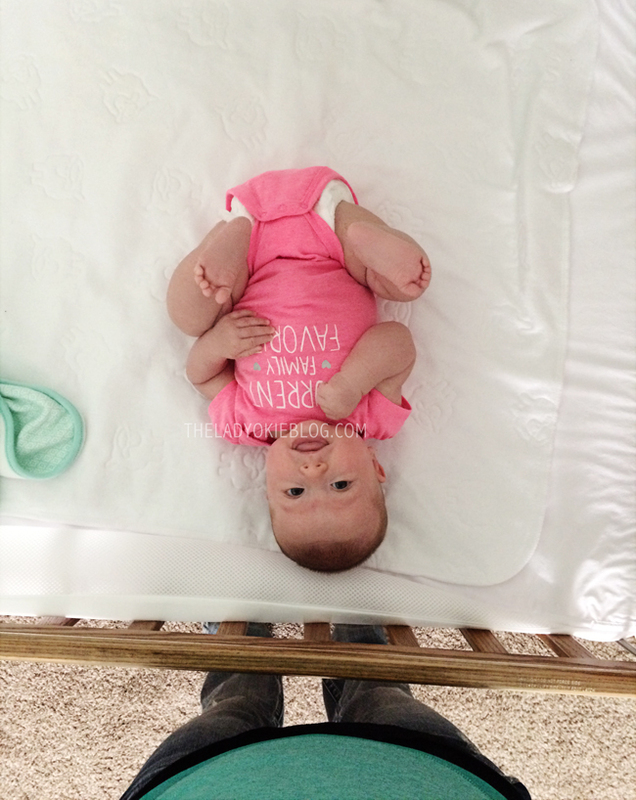 baby girl clothes are seriously adorable. i have issues and i don't even have a baby.